The latest Canada SPIVA® scorecard landed recently. While data up to the end of June 2018 was consistent with results from previous SPIVA Canada scorecards – active management once again found it challenging to beat the passive benchmarks – there were pockets of success. Here are a few highlights. Active managers found it difficult to beat the Canadian equity benchmark. Although trade tensions and concerns over global economic growth threatened the upward trajectory of the Canadian equity benchmark S&P/TSX Composite earlier this year, an accompanied rise in dispersion did not lead to an improvement in relative performance by active Canadian equity funds. A chunky 93.22% of Canadian equity funds underperformed the S&P/TSX Composite’s 10.41% rise in the 12-month period ending in June 2018. As exhibit 1 makes clear, such underperformance was unrivalled across other regions globally. Exhibit 1: Percentage of Funds that underperformed their respective benchmarks. Source: S&P Dow Jones Indices. Data as of June 30, 2018. Chart shown for illustrative purposes only. Past performance is no guarantee of future results. Canadian managers did not fare well in international equities either. In further signs that active managers may have found it difficult to navigate the impacts of trade tensions and concerns over a global economic slowdown, International Equity funds recorded a notable increase in underperformance over the last 12- months. Nearly 90% of category’s funds lagged the S&P EPAC LargeMidCap (versus 73.08% reported in our year-end Canada SPIVA scorecard). Underperformance also rose among funds investing in U.S. equities: only 27.59% of managers beat the S&P 500 (CAD) over a one-year horizon, compared to 30.59% from our year-end 2017 scorecard. Dividend-focused active equity funds yielded better results. Although the majority of funds in six of our seven categories lagged their respective benchmarks since the end of June 2017, Canadian Dividend & Income Equity Funds offered the exception. Perhaps helped by avoiding sizeable negative contributions from a handful of S&P/TSX Canadian Dividend Aristocrats® constituents, an impressive 67.57% of active funds beat the benchmark. But we will have to wait and see if this pattern continues: 100% of the category’s funds lagged the benchmark over a ten-year horizon, demonstrating that performance can vary from year-to-year. 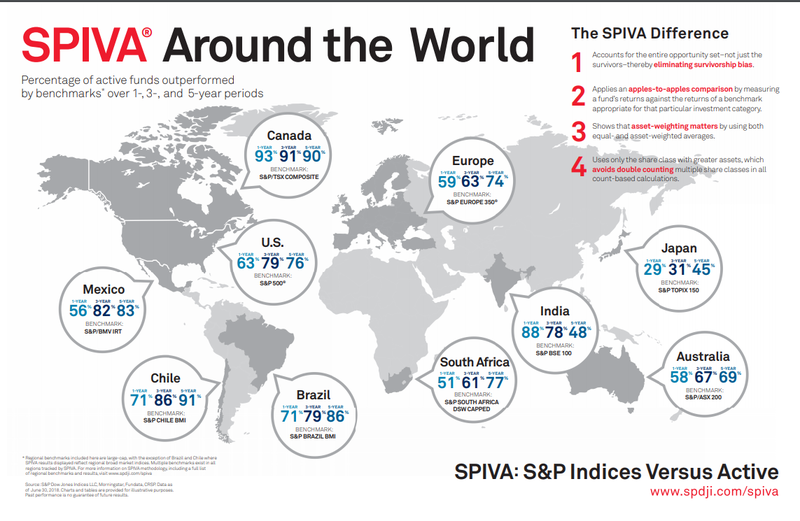 As a result, while some market participants may hope that the future holds better prospects for active management, our SPIVA scorecards continue to show how difficult it can be to (persistently) beat passive benchmarks.